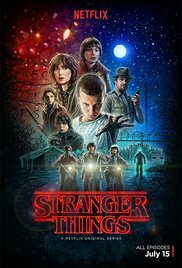 ORBzine - TV Review: "Stranger Things"
This starts with an unseen monster breaking out of a US Government lab. 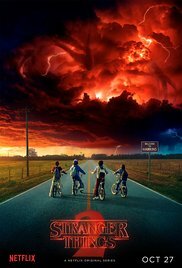 If this sounds familiar, it is reminiscent of The Mist - and it is certainly not the only Stephen King reference in this show. The storyline takes place in smalltown USA in the 1980s. Some early-teens boys are playing a Fantasy role-playing game. It is late in the evening, so they cycle home. One of them gets chased by a monster, probably the same one from lab. A young girl appears in the woods. She is being hunted by Men in Black commanded by Dr. Martin Brenner (Matthew Modine - Jack and the Beanstalk: The Real Story ). It seems this show is not unlike The Watchers , only with the girl instead of a dog. The missing boy's mother ( Winona Ryder ) thinks her boy is trying to communicate with her. In a series full of talented performers, Ryder steals the show with her descent into insanity. The boy's friends have started their own parallel investigation, riding around on their BMX bikes like The Goonies . They shelter the mysterious girl and give her a name - Elle (short for Eleven). The Sheriff has tracked the kid's trail to the secret Federal Government base in the woods. The Feds give him a quick tour, but he works out they are holding something back. The Goonies get Elle to help them search for their friend. She indicates that he is off the map (on the flip-side, in fact), menaced by a monster ... and then leads them to his home. The family must prepare for the funeral. However, not everyone is certain that the missing person is really dead. The boys dress Elle up as a girl, and take her to school. They plan to use the school CB radio in an attempt to contact their missing friend. Dr. Martin Brenner (Matthew Modine - Jack and the Beanstalk: The Real Story ) sends an explorer through the portal. The smart thing to do would be to use a video camera on a pole, but they instead decide to risk a man's life for no reason. After all, they have all seen the damage that the monster did. Why would they send an unarmed man into its lair? The Sheriff knows about the cover-up. He infiltrates the secret base. Unfortunately, he has everything backwards. He thinks there is only one child involved, when there are two. He thinks a child went into the base, when it came out. And he thinks the security is to keep people out, when in fact it is to keep something in. The Goonies go looking for the portal. They follow the train tracks to get there. This is yet another Stephen King reference, this time to Stand By Me. The elder teens also go off together, this time on a monster hunt. As always, there is a lot of teen angst. However, they should know better than to linger in the woods - especially after darkness falls, when there is a monster on the loose. The sheriff finally has a proper conversation with the missing boy's mother ( Winona Ryder ), and they start to put things together.